Book Purchases - We provide funds for the purchase of books and to supplement the Branch's annual book budget. 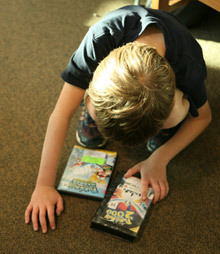 Audio-Visual Collections - Friends purchase audio/visual materials. Over the years our collection of books on tape, CDs, DVDs and videos has grown considerably, to one of the best in the system. Speaker programs - We present authors and speakers of interest to the community on a regular basis. Musical programs - We host occasional music programs such as a program on the patio outside the library’s community room where people danced to very lively Louisiana music performed by Bonne Musique Zydeco. Book sales - Book sales are held several times a year. Creative writing for youth and adults - Each year the Friends host creative writing contests for youth from first through twelfth grade and adults. Entries are judged by Friends members and prizes are awarded at a ceremony at the library. Click on Library Programs for more details. Bibliofile - We publish a bi-annual membership newsletter of all of the Friends activities. Support of inner city libraries - We provide additional funds in support of several inner city branches. Library maintenance - Chryalis comes twice a week and we also provide gardening services every week. Equipment purchases - We have purchased audio/visual equipment, blinds, patio furniture, and shelves for books. Friends also sponsor children's events, holiday programs, and exhibits.